NETWORK FINALS: There were no changes from the preliminary numbers for Friday. CABLE HIGHLIGHTS: Baseball reigned over Friday cable, with Fox Sports 1’s ALCS playoff game at 2.11. ESPN’s NBA doubleheader was at 0.96/0.77. On Discovery, GOLD RUSH rose 0.05 to 0.77, and the lead-out special was down 0.02 to 0.41. A&E’s LIVE PD ticked down to 0.52. HBO’s REAL TIME WITH BILL MAHER returned at 0.43, and the season premiere of TRACY ULLMAN’S SHOW was at 0.11. The Adult Swim WILLIAMS STREAM late-night segments were at 0.35/0.32, compared to last week’s 0.36/0.31. Cartoon Network’s early-evening TEEN TITANS GO was at 0.28. On Disney Channel, RAVEN’S HOME gained 0.02 to 0.27, and STUCK IN THE MIDDLE was up 0.06 to 0.25. Nickelodeon’s morning PAW PATROL was at 0.26. Another AMC promo special for THE WALKING DEAD was at 0.25. 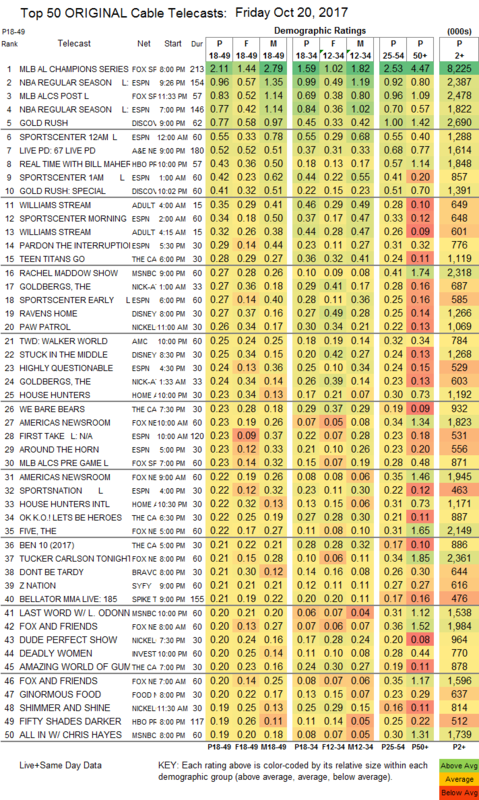 On HGTV, HOUSE HUNTERS was steady at 0.23, and HOUSE HUNTERS INTL ticked down to 0.22. Bravo’s DON’T BE TARDY shed a tick to 0.21. On Syfy, Z NATION climbed 0.04 to 0.21, and the premiere of SUPERSTITION was at 0.12. Spike’s BELLATOR was at 0.21. ID’s DEADLY WOMEN fell 0.04 to 0.20. Food Network’s GINORMOUS FOOD was at 0.20. We’s MARRIAGE BOOT CAMP rose 0.04 to 0.17. 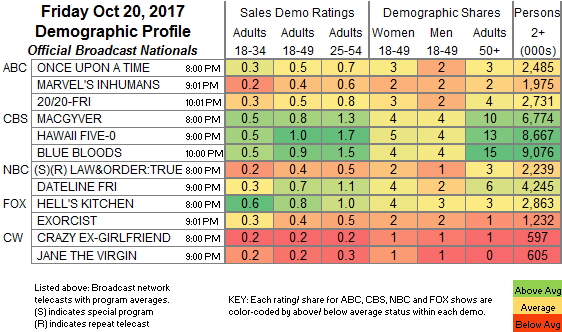 On TLC, KINDRED SPIRITS ticked up to 0.10, and EVIL THINGS was up 0.02 to 0.10.